Since 2015, Python language has marked its remarkable space. Experts usually prefer this language and it is considered as a prevalent and best language. Basically, This language is a high-level programming language for general-purpose programming. It has a design philosophy and makes it own readability. It is an open source and a number of developers give preference to this language. Even it has been seen that number of students looks for the python career opportunities and there is a wide scope of python language in India. Basically, Python was introduced in the year 1980 but was not able to get that attention, but in the 21st century, Google has done some changes in the language which affects the performance and made it better and effective, Van Rossum made the code public in 1991. The one reason behind its productivity is Data Science and machine handling they both play their vital role in improve and it is the main driver of the fast development. Python language is essential for the industry and it has been noticed that this language is growing rapidly. Different cities have different salary criteria but Banglore is number 1 city in India and as a python developer city and after it the best city for the language is Pune and on the third number the city has occupied is Chennai and at last Delhi. It has a wide scope and increase huge job opportunities also, opting this language will never be a wrong decision as this language is the fastest growing language as well as by working on this language you can easily work on different profiles such as Software Engineer, Research Analyst, Data Analyst, Data Scientist, Software developer etc. In Python language, you get a chance to increase your skills and enhance them. 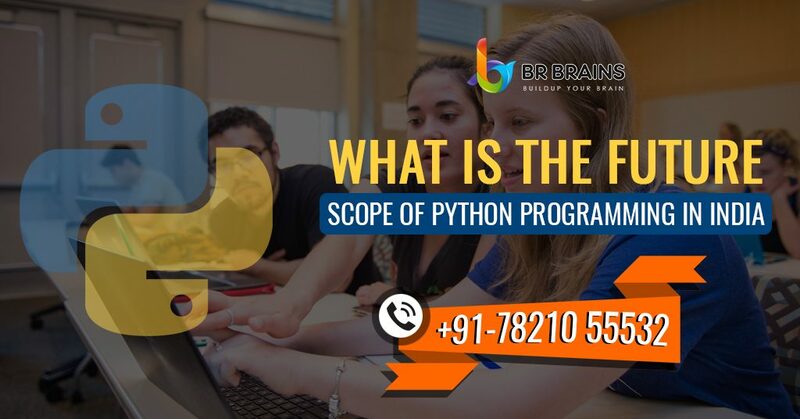 There are many benefits of python programming language, If you are looking to have a career growth in this language then opt for BR Brains the best training academy in India and the best part of BR Brains is it is a sister branch of BR Softech – world best IT Company. In BR Brains you will get a hundred reasons to pursue your training.as we have a professional and experienced faculty our professional team is always ready to guide the students in the best way. Professional Environment: BR Brains provide you the professional environment where you learn things as well as you experience the professional environment. Best Faculty: We have the best faculty who has unique skills and best qualifications which are beneficial for the freshers. Job Assurity: If you are best in your training so you can get the job over here only BR Brains give you an opportunity to work for BR Softech. So, here we have told you about the career in the Python language in India and how you should pursue it.